From the Civil War pension application of Christian E. Zipperer. Christian Edward Zipperer was born January 8, 1825, in Effingham County, Georgia. He was five feet eight inches tall, with a ruddy complexion, blue eyes, and brown hair. 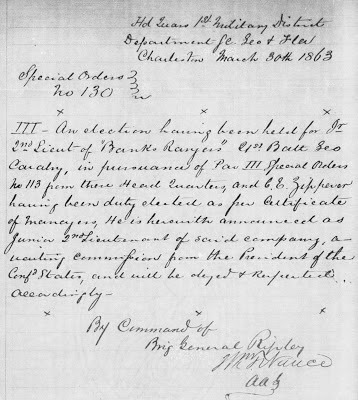 On September 7, 1861, at Savannah, Georgia, he enlisted as a Private in Captain Bird's Mounted Company (Effingham Hussars), Company A , 2nd Battalion Georgia Cavalry. He was 36 years old. A portion of the card file for the Oath of Allegiance for Christian E. Zipperer when he was released from Fort Delaware. It notes his physical description. 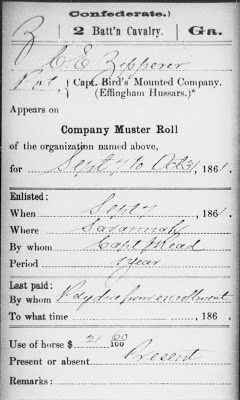 A portion of the card file for Christian E. Zipperer of his enlistment as a Private in Captain Bird's Mounted Company (Effingham Hussars), Company A, 2nd Battalion Georgia Cavalry. On April 30, 1862, Christian was discharged "by virtue of conscription act and paid up in full May 3, 1862." He enlisted again in Savannah on November 10, 1862, in Banks' Company of Partisan Rangers. This company became Company B, 21st Battalion, Georgia Cavalry on February 11, 1863, when it was merged with White's Battalion. Christian was elected Jr. 2nd Lieutenant of this company on March 20, 1863, while at Camp Easley in Christ Church Parish, South Carolina. His pay requisitions show that he made $90.00 a month as a 2nd Lieutenant. Special Orders No. 130 about the election of Christian E. Zipperer to the rank of Jr. 2nd Lieutenant during the Civil War while he was with Company B, 21st Battalion, Georgia Cavalry. By September 1863, Christian and his company were in Waccamaw, South Carolina. He signed a requisition at that time for corn and rice to feed the horses at "Camp Ward" in Waccamaw. That same month, he asked for and was granted 20 days leave to go home to check on his family (see below). At this time, he and his wife Salome Seckinger had nine children. 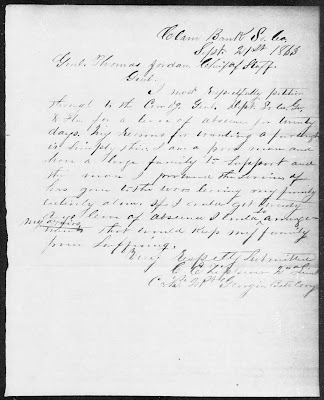 Letter from Christian E. Zipperer to General Thomas Jordan, written on September 21, 1863, asking for a leave of absence to check on his family's welfare. Genl. Thomas Jordan, Chief of Staff. I most respectfully petition through to the Comdg Gen. Dept. So. Ca. Ga. & Fla. for a leave of absence for twenty days. My reasons for wanting a furlough is simply this: I am a poor man and have a large family to support and the man I procured the lives of has gone to the war leaving my family entirely alone. If I could get twenty days leave of absence I could so arrange my affairs that would keep my family from suffering. 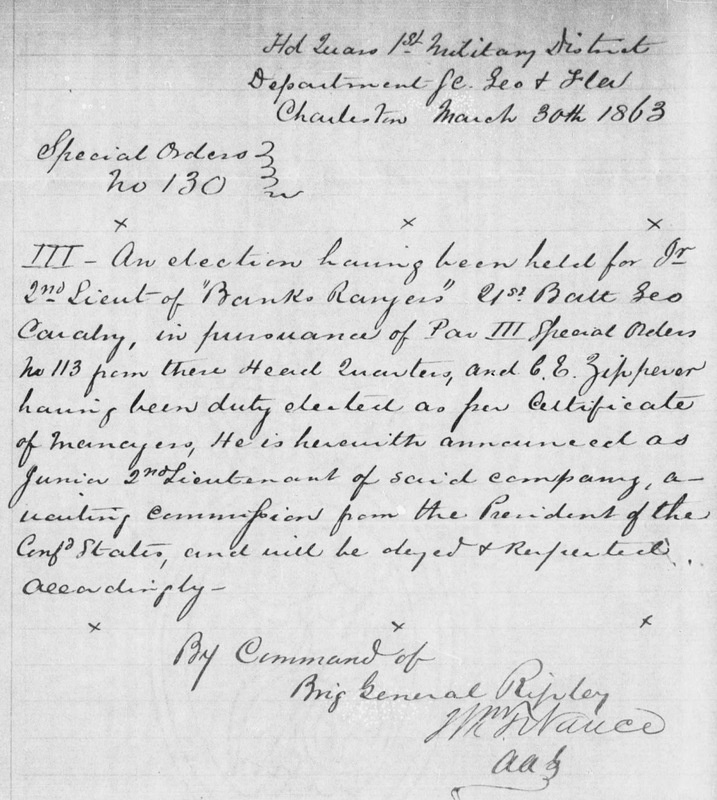 On February 13, 1864, the 21st Battalion was dissolved and Christian's Company B, along with Companies A, C, and E, was consolidated with the 24th Battalion Georgia Cavalry and the Hardwick Mounted Rifles to form the 7th Regiment Georgia Cavalry. Ordered to Virginia, the 7th Regiment joined up with P.M.B. Young's and Gary's Brigade, Army of Northern Virginia (see National Park Service, Civil War, Confederate Georgia Troops). 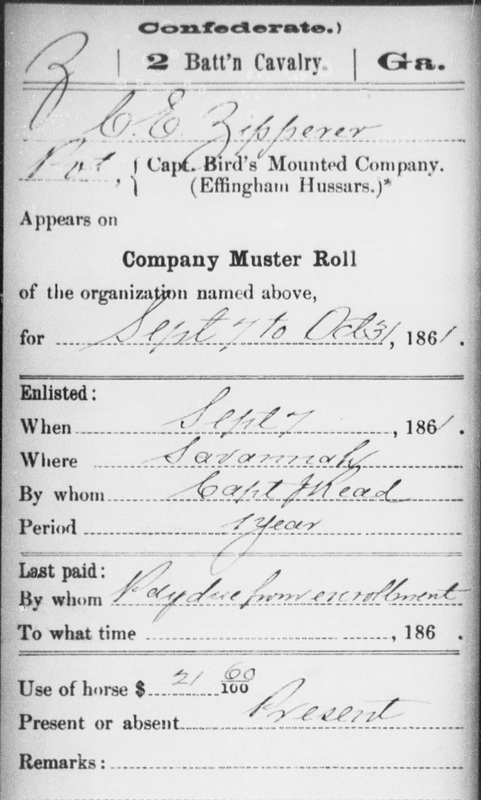 Christian's unit was Company E.
Notation at the bottom of Christian E. Zipperer's card file for his January-February 1864 Muster Roll about the formation of the 7th Regiment Georgia Cavalry. In the summer of 1864, Union Major General Philip H. Sheridan headed out on June 7 to destroy the Virginia Central Railroad junction located at the town of Gordonsville, Virginia. 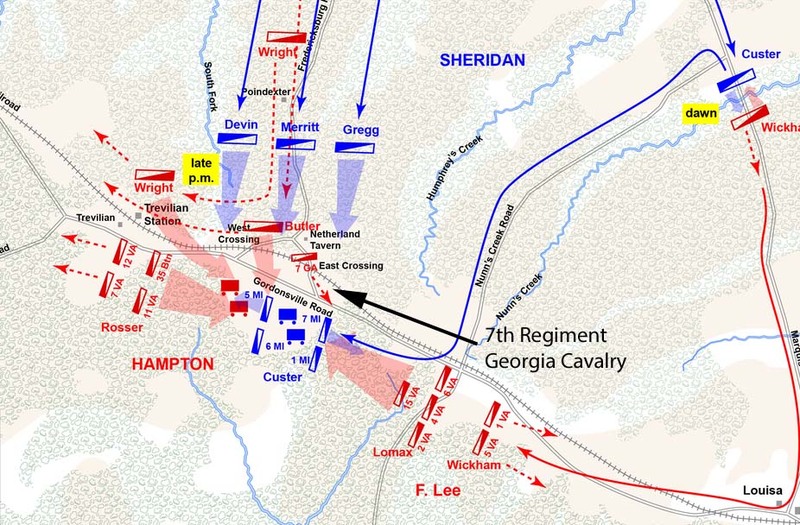 Confederate Major Generals Wade Hampton and Fitzhugh Lee arrived at Trevilian Station, a stop on the railroad in Louisa County east of Charlottesville, Virginia, on June 10 to halt Sheridan's advance. 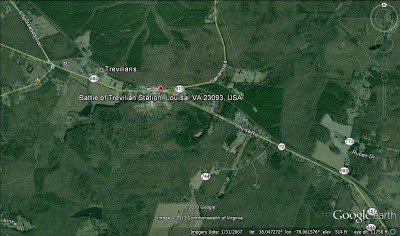 The battle began the next day on June 11, 1864, and it was the day that Christian was captured (see Trevilian Station Battlefield Foundation). The battle continued on June 12, but by this time, he was on his way to a northern prison. 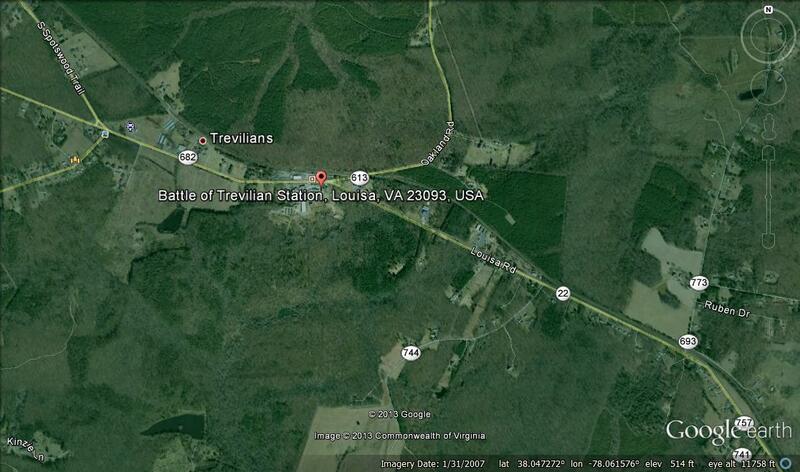 Google Earth aerial of Trevilian Station today. Christian arrived at Fortress Monroe at Point Lookout, Maryland, on June 20, 1864, and on June 23, he was transferred to Fort Delaware, on Pea Patch Island, Delaware. He was checked into the prison on June 25. What were prison conditions like at Fort Delaware? Who was looking after his family while he was there? I imagine he was worried about how they were getting along without him and wondered whether or not he'd make it out of the prison alive. 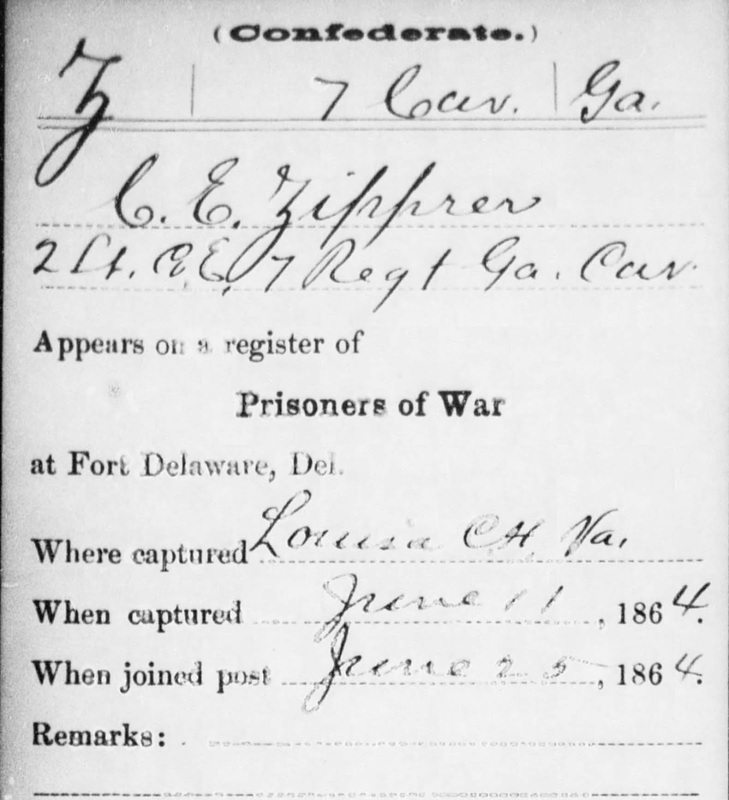 A portion of the card file for Christian E. Zipperer's Prisoner of War register. It notes his name, rank, where and when he was captured, and when he arrived at Fort Delaware. 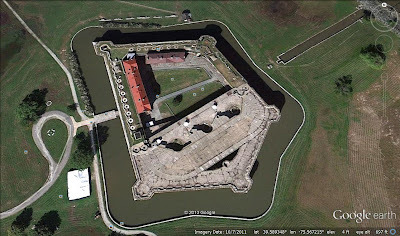 Google Earth aerial of Fort Delaware, Pea Patch Island, Delaware, where Christian E. Zipperer was held prisoner during the Civil War. Once at the fort, Christian was given one set of clothes, an overcoat, and one blanket. (Some sources say the men were given additional clothing.) While in prison, he endured the hot summer, a very cold winter, and the spread of contagious diseases. The prisoners tried to make the best of things. They had a handwritten newspaper called Prison Times, and they held debates and concerts. Some of the prisoners set up businesses to earn money, and they even had their own charitable organizations to help their sick and less fortunate prison mates. In June 1864, there were 8,000 prisoners at the fort that was built to hold far less. The barracks were overcrowded and drafty, and some prisoners died from exposure during the winter. With overcrowding and the weakened condition of the men, diseases were rampant. Over 200 prisoners and guards died from a small pox epidemic that broke out in October 1864 (see Fort Delaware State Park, Prison Camp Trail Guide, A Brief History of Fort Delaware and Fort Delaware State Park, Timeline of the Civil War at Fort Delaware). Christian was released on June 4, 1865, after he swore an Oath of Allegiance to the United States, nearly a year after he arrived at Fort Delaware. Now he could go back home to Effingham County, Georgia, and his family. I wonder how long it took him to get home and what he found when he got there. 1. 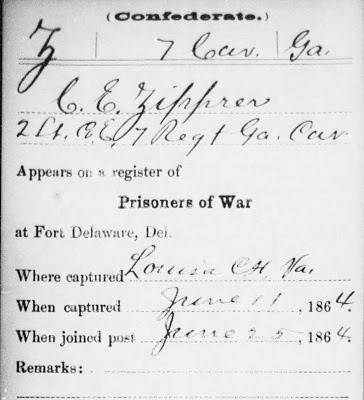 C. E. Zipperer (2nd Lt., 7th Georgia Cavalry, Civil War), Record Group 058-01-001, Confederation Pensions and Records, Pension Office, Pension Applications. Images. Georgia's Virtual Vault (http://cdm.sos.state.ga.us:2011/cdm/ : accessed 20 June 2013). 5. National Park Service, Civil War, Confederate Georgia Troops, 7th Regiment, Georgia Cavalry (http://www.nps.gov/civilwar/search-regiments-detail.htm?regiment_id=CGA0007RC : accessed June 29, 2013). 6. Trevilian Station Battlefield Foundation," The Battle, June 11-12, 1864"(http://www.trevilianstation.org/battle.htm : accessed June 29, 2013). 7. Fort Delaware State Park, Delaware City, Delaware. "Fort Delaware During the Civil War" (http://www.destateparks.com/park/fort-delaware/civil-war/index.asp : accessed June 29, 2013). 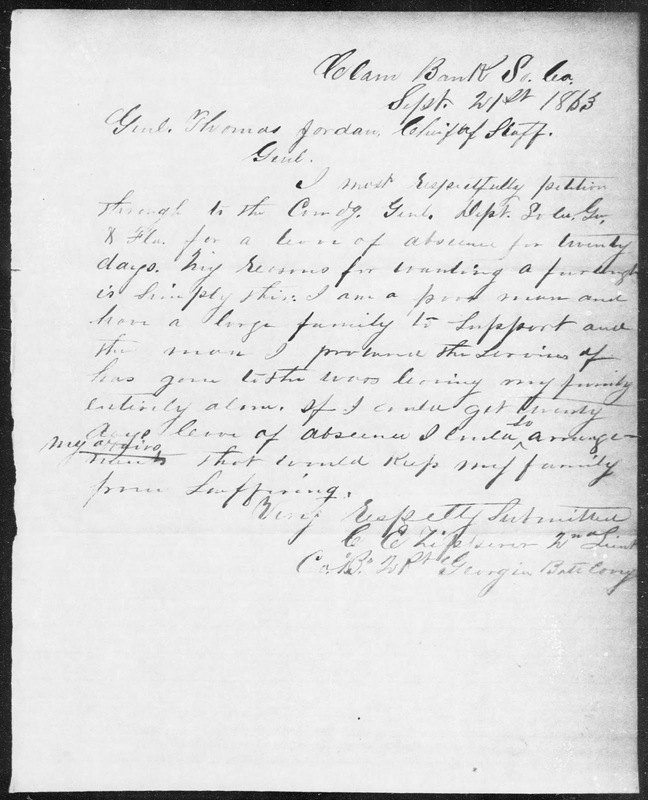 This is a complete and fully documented account of the Civil War service of your children's 3rd great grandfather, from enlistment to release. It's remarkably thorough. I've never before seen a request for a leave of absence to check on your family's welfare. I believe the line in the letter says, "and the man I procured the services of." The conditions sound hard at Fort Delaware, and he was lucky to survive. Yet I've read about prisons in this war where conditions were even worse. This is a great model of tracking a soldier's service in the Civil War through documents. Thanks Mariann! And thanks for deciphering that word. I just could not come up with what it might be. I'll update the transcription. I've read about worse conditions, too. Andersonville comes to mind. I've also read about retaliations against the prisoners on one side because of how the other side was treating theirs.